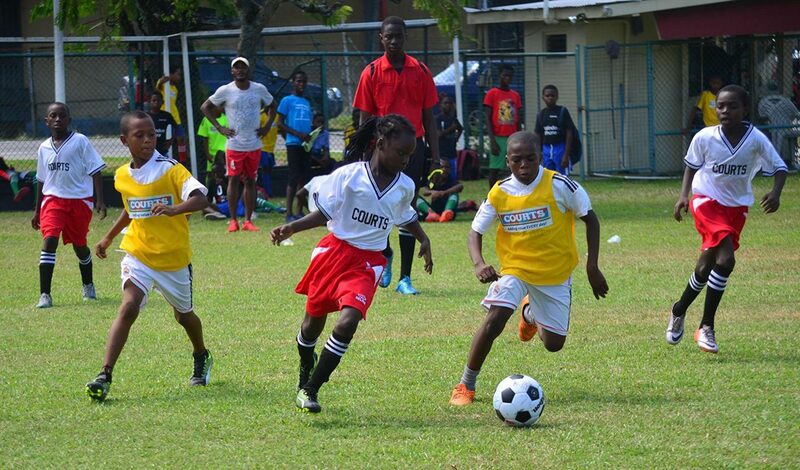 Sophia needled two-time defending champion St. Angela’s 1-0 when the seventh annual Petra Organization coordinated, Courts Pee Wee Primary Schools football tournament continued yesterday. It was the first defeat in two years for the Thomas Street unit. David Weeks found the back of the net in the 12th minute at the Thirst Park ground for the game winner. Meanwhile, Plaisance, West Ruimveldt, St. Pius, Marian Academy, Parfait Harmony and Stella Maris all secured lopsided victories. Plaisance recorded the largest margin of victory in the event, defeating Goed Fortuin 11-0. Jamal Ali scored in the third, eighth, 14th, 15th and 18th minute while Ronaldo Harry registered a hat-trick in the fifth, 12th and 13th minute. Adding a brace in the 28th and 30th minute was Stephon Atkinson while Clinton Rickett netted in the 16th minute. Similarly, West Ruimveldt crushed Supply 6-0. Ian Daniel bagged a hat-trick in the sixth, 19th and 20th minute. Assisting with goals in the 10th, 13th and 28th minute were Mickon Vanderburg, Devon Chance and Richie Samroop respectively. In another fixture, St. Pius brushed aside Soesdyke 5-0. Dwayne Baptiste recorded a helmet trick in the first, second, 13th and 15th minute while Haden Wellington scored in the third minute. Marian Academy humbled Winfer Garden 7-0 with Asher Adams netting twice in the fifth and ninth minute. Bradley Walton netted twice in the 12th and 27th minute and Michael Alphonso scored in the 29th and 30th minute. Adding a goal in the 20th minute was Malik Barker. Stella Maris brushed aside Timehri 3-0. Fedel Norville bagged a hat-trick in the 13th, 17th and 21st minute respectively. In other results, North Georgetown downed Grove 2-0 via goals from Derwin George and Krystin Gonsalves in the fourth and 22nd minute each. Victoria edged South Ruimveldt 1-0 through a Kelon Croal strike in the 25th minute while School of the Nations needled Mocha 1-0 through a Timothy Brathwaite 12th minute effort. St. Ambrose downed Den Amstel 1-0 with Jacob Rodney netting in the 29th minute. Smith Memorial defeated Colaaco 2-0. Joshua Waterman and Shabaz Cameron scored in the first and 14th minute apiece. Mae’s squeaked past St. Stephens 1-0 through a Mickhail Mason effort in the 29th minute, while St. Agnes overcame Redeemer 1-0. Jamaine Crum-Ewing found the back of the net in the 25th minute. Tucville and F.E. Pollard battled to a scoreless draw while St. Margaret’s and Enterprise played to an identical result. The event resumes Saturday with the final round of group matches.